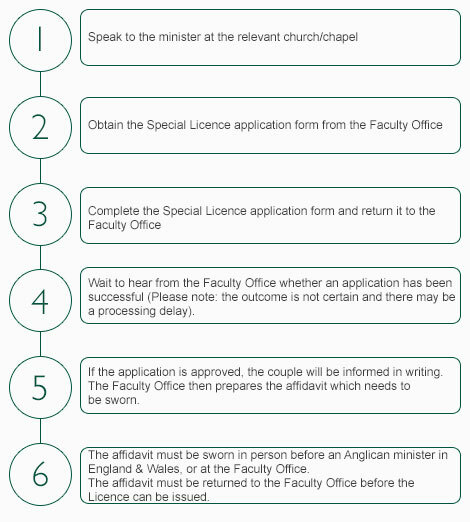 (6) The couple are required to attend an interview at the Faculty Office in Westminster. If all is in order, the affidavit will be sworn at that same appointment. A couple who know they need a Special Licence should apply as soon as the minister has agreed to conduct the service. The application form is available on request from the Faculty Office, in hard-copy only; it is not available to download or be sent by email. Applications can be made up to 18 months in advance of the proposed wedding date. Other arrangements should not be made until it has been confirmed in writing that a couple’s application has been approved and a Licence will issue. The form contains full instructions. The application fee is published on the form each year, and if the fee has changed recently the details of this may appear on our ‘Marriage Law News’ page. Part of the form is to be completed by the couple, and part by the minister who will conduct the service. There will also be guidance notes for the applicants and the minister. It is important that full addresses and telephone numbers are given and that the connection between the couple and the church is set out fully. The bride and groom must both include with the completed application form a copy of their passport or other valid proof of nationality. When an application is received we will write to either the officiating minister or to the couple. Depending on the circumstances of the application there may be a processing delay of up to 4 or more weeks before the couple hear from us. Please do not make any arrangements whilst the application is being considered, as the outcome is not certain. Once the application has been approved, the bride or groom will have to swear an affidavit (a formal legal statement) to confirm the information given. When the affidavit has been correctly sworn and the Faculty Office has confirmed that all is in order, the Licence itself will be sent out to the minister who is to conduct the service about three weeks before the wedding. The arrangements for swearing the affidavit depends on the nationality of the couple; see (1) and (2), below. This can be done in front of any Anglican minister in England & Wales (to whom a fee of £5 will be payable) or at the Faculty Office (when no extra fee is charged). If the couple choose to do this locally, a form of affidavit will be sent to either the bride or groom (i.e. the person who has indicated on the application form that they will swear the affidavit) with full instructions. The affidavit should be taken in person to the minister and completed at that appointment. Once completed by bride/groom and the minister it must be returned to the Faculty Office. If the bride/groom wishes instead to visit the Faculty Office to swear the affidavit, they will be requested at the appropriate time in the application process to ring the diary secretary at the Faculty Office and book an appointment for swearing the affidavit. An interview will be held at the Faculty Office in Westminster. The couple will be requested at the appropriate time in the application process to ring the diary secretary at the Faculty Office and book an appointment for the interview. If all is in order, the affidavit will be sworn at that same appointment.